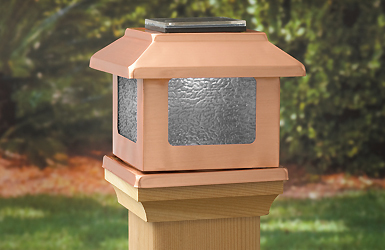 These beautiful Solid Copper Convertible Solar Lights with Dual-LEDs or candle fit 4" x 4" posts as caps & add a charming touch to your bridge, porch, fence, or any outdoor area. Includes 2 Tea-Candles. Our Convertible Post Cap Lights lend an intimate glow to your deck, porch, bridge or fence. Light up your area using the included solar cell or insert a Tea-Candle for an Old World look. By day, these post caps add a charming touch to any outdoor area. By night, they enhance the area with lovely accent lighting—without the hassles of wiring or electricity! Enhance your home at night with a soft, welcoming glow. Use the included solar cell or insert a tea candle for an Old World effect. No Wiring, No Electricity, & No Hassles! 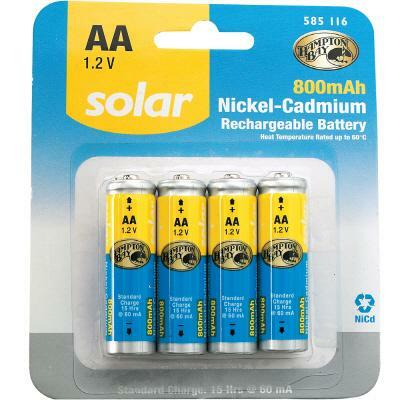 If the rechargeable batteries provided will no longer recharge, they can be replaced with our AA rechargeable batteries. The life depends on the quality of the batteries purchased. Remove the solar panel by lifting it straight up from the top of the cap. Remove the plastic tab in the battery compartment to allow for terminal connection. Ensure that the batteries are securely in place. Your solar post cap light will need 24-48 hours of sunlight to fully charge. Your Solar Tiffany-Style Post Cap is now ready to be installed on your post. To attach to the post, apply an exterior-grade construction adhesive to the inside edge of the molding at the bottom of the light and place it firmly onto the post. The solar collector will charge the batteries during the daylight hours and power the light during darkness. Your solar post cap light will stay lit for an average of 6 to 8 hours during the night and turn off during the day, allowing the solar collector to re-charge the batteries. The actual amount of direct sunlight received by the solar panel determines the length of time the light will remain lit after dark. If your solar post cap light becomes dim or does not light, simply allow the solar collector to fully re-charge the batteries.